Bonnie Katherine Hancock Peterson, age 88, passed gently from this life to the next on Tuesday morning, January 26, 2016. Born November 29, 1927 in Hawthorne, California to loving and hard-working parents, Oliver Perry and Lora Aseneth (Lisonbee) Hancock. Bonnie was raised in Pinedale and Mesa Arizona. While a student at Brigham Young University, Bonnie met her future husband, Marion G. Peterson M.D., one Christmas break when they both shared the same ride home from Utah to Mesa. They were married the following August 28, 1947, starting a love affair that would span over fifty years and raising their children in a home filled with love and happiness. Their children are: Sharilyn (David) Wilson, Susan (Stanley) Martineau, Klay (Cindy) Peterson, Kathryn (Scott) Blackham, Annette (Terry) Hill, Howard (Julie) Peterson, Marvin (Patricia) Peterson, Mary (Bruce) Kiene, Marion (Christy) Peterson, Steven (Ginger) Peterson. Bonnie was very proud of her posterity—she has 65 grandchildren and 121 great grandchildren (and still counting). She was preceded in death by her husband, Marion, her brother, Joseph Hancock and her sister, Delite Gaddie. She is survived by her sisters Dixie Krauss, Dorene Smith, Carlene Curtis, and Lora Sue Allred. Bonnie had many interests and talents. She traveled the world and lived in Japan, China, and Mexico. 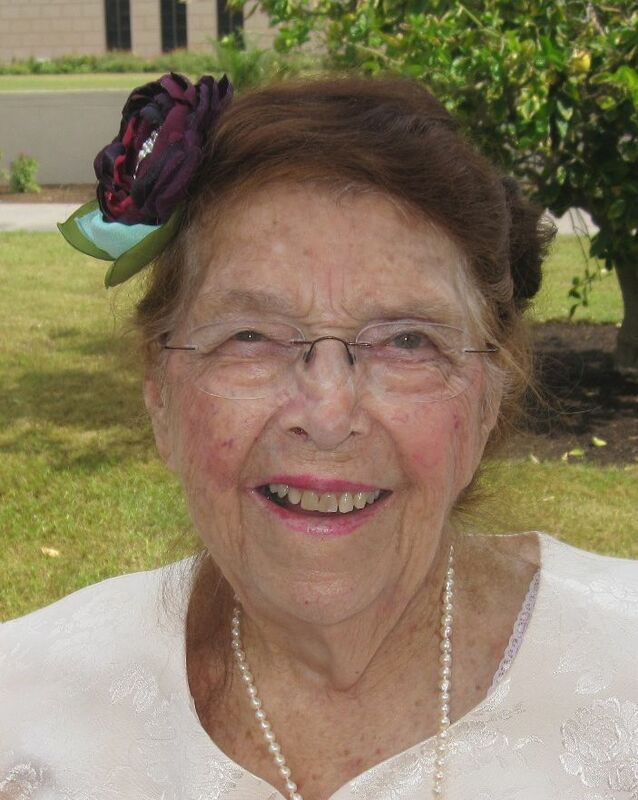 She was a skilled genealogist, seamstress, gardener, cook and musician. To the very end of her life, she had a sharp intelligence, a keen sense of humor and a fearless outlook. She was adored by family and friends alike and will be greatly missed. Funeral services are Saturday January 30, 2016 at 12:00pm, preceded by a viewing Friday evening January 29, 2016 from 6-8pm and a viewing Saturday morning from 10-11:30am. All services will be held in the LDS chapel on 933 E. Brown Road, Mesa Arizona. So sad to see the passing. So happy to know where she’s going to be now. Love and prayers to the families. Bonnie is a wonderful woman. It has been a pleasure always to visit with her and to know her family. It is so difficult to let our loved ones go but how blessed we are to know that she has graduated with honor and is now with others who love her and who have been waiting to be reunited. Our deepest love and empathy go out to her family. We pray that you will be comforted and find peace during the difficult moments and that you will always find strength and comfort in all the memories of her exemplary life and the great love she has for each of you. I’m so sad to hear of the passing of Bonnie. I loved her and all your family. I’m even sadder that I did not hear about it until February, so please accept my belated condolences. Love and prayers to you and yours.